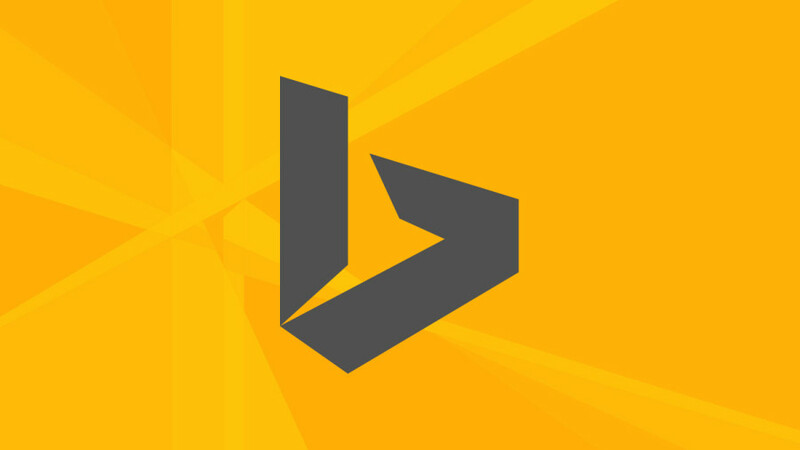 Bing Ads is rolling out an upgrade to their advertising management tool on March 23, 2015. For advertisers, this means a more streamlined way to target searchers, regardless of where they are searching. Now, all campaigns will target all devices by default (hence the name of the upgrade: “Unified Device Targeting” or UDT). However, it’s still very easy to adjust your bids to increase impressions on one device or another. You only need to make changes to your current campaigns if you have multiple instances of the same campaign which target smartphones in one instance and PC/Tablets separately in another instance. These will need to be combined, see below for details. While this will not affect most advertisers, we strongly encourage you to read the following information and review your campaigns ahead of the migration to ensure that you are ready. All existing campaigns will be opted in automatically to receive traffic from all devices. If you have a campaign that currently targets all devices, you won’t be impacted. However, we encourage you to make sure your website looks good and functions as it should on the smaller smartphone screen. Bids and bid adjustments won’t be changed during the migration. The chart below outlines the current devices targeted, and the impact to each. Evaluate and merge any campaigns that will be redundant after the UDT rollout. For example, if you have copied a desktop campaign to create a second mobile-only campaign, these campaigns will now need to be merged. Maintain control and visibility of campaign performance. It may be difficult to determine later which ads were served, and how they performed, if campaigns are not merged. Make sure that your campaigns are structured properly so that Bid Adjustments work as you expect. Proper campaign structure is also critical to ensuring that you get the performance reports you need to optimize your campaigns later. Avoid the potential pitfall of bidding against yourself. In the worst case scenario, if you do not merge your campaigns, you may actually wind up with duplicate campaigns competing against each other once targeting changes are made. All bid adjustments use the desktop value as the primary or baseline bid. You no longer need to have separate bids for mobile and PC/Tablet. IMPORTANT: Changes to the desktop bid will affect bids on all devices. Apply bid adjustments to target your desired device audience. Bid adjustments indicate that you are willing to pay more or less for clicks from searchers who meet your targeting criteria. They are represented as a percentage less than or greater than your primary bid. 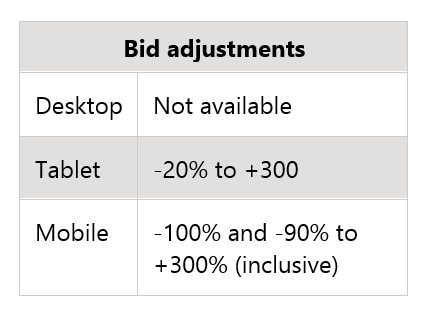 Selecting “increase by” means the (tablet or mobile) bid will be higher than desktop. Selecting “decrease by” means the (tablet or mobile) bid will be lower than the desktop by that percentage. If you do not want your ad to reach mobile users at all, adjust your bid to -100% for mobile and you are essentially “opting out” of mobile. Note, however, it is not possible to opt out of tablet serving. You can decrease your tablet bid by up to -20%. Bid adjustments can be set at both the campaign and Ad Group level. Bid adjustments set at the Ad Group level will override bid adjustments set at the Campaign level. Because bid adjustments can be set at multiple levels, be sure that your campaigns are structured so that bid adjustments work the way you expect. TIP: If you use Bing Ads Editor to manage your campaigns, you can make updates to multiple campaigns at the same time (“bulk updates”). After logging in to BAE, select the campaigns for which you want to change bid modifiers. Click “Additional Targeting” at the bottom of the page. Select “Device” on the left side of the screen, then check the “Smartphones and other mobile devices with full browsers” box. Enter the desired bid modifier. These changes will persist throughout the migration. The chart below illustrates the adjustment ranges available. Once campaigns launch, you will want to evaluate the campaigns daily and adjust your budget accordingly until you find the optimal bid/bid adjustment combination for your campaigns. If you originally had one campaign, you may want to increase the budget to make the most of mobile. If you had two campaigns that have merged, the two budgets should also be combined with any additional to boost traffic. TIP: remember that mobile devices typically only display the top 2 ads. In order to ensure that your ads are seen by on-the-go searchers, remember to adjust your bids and budgets to secure one of those top 2 placements. I hope these tips will help you prepare for the changes coming with Unified Device Targeting. If you have not experimented, or have only limited experience with mobile campaigns, use this time to test and learn. Be sure to check back later this week for tips on merging campaigns, and next week for best practices for mobile search campaigns. Questions? Check out our FAQs. Comments? Leave them below, or you can ping Bing Ads on Twitter.